We keep repeating this ad nauseam , triangles occur only in waves b or 4, nowhere else, so when you see one, or think you see one, you know where you are in a given sequence of patterns. But the market is very adapt at fooling you so the best approach is to look at the balance of the possibilities. 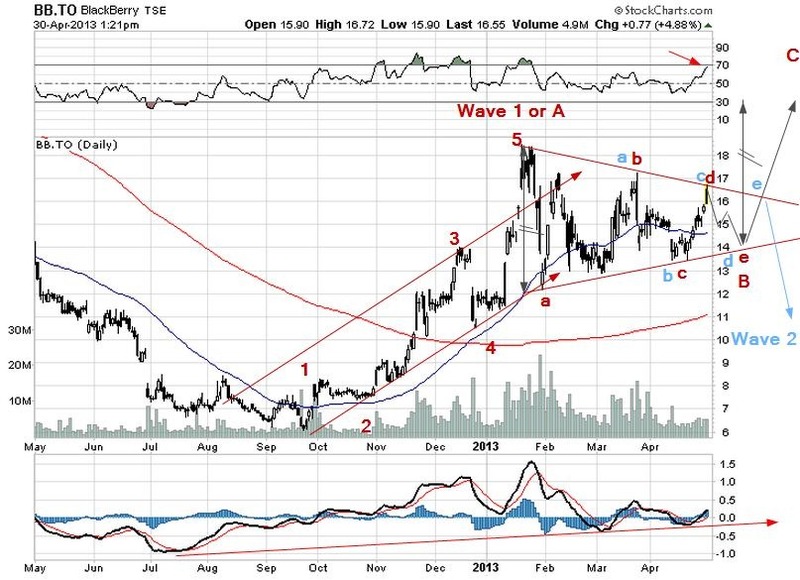 If this is a triangle we should go down in wave e right away to around $15 to $14 ($13.50 max.). This would be a b-wave rather than a wave 4. Given its size that is a reasonable assumption at this point. A logical target would be at $20 as a very minimum going all the way to, possible, $26. A stop at $13 is warmly recommended just in case it turns out to be a b-wave within a wave 2 , shown in blue (see earlier blogs). You risk a dollar at the most if your stop is triggered and then you can try again somewhere around $10,50. If not your reward is about $5+ , or roughly 30%. The RSI is in line with this scenario and so is the MACD. Furthermore the CEO has just become a Canadian suggesting he is here to stay.